Our Buy a Round, Get a Round Promo is back! This weekend - Saturday 4/20 and Easter Sunday, 4/21! We're bringing back this great offer for one weekend only! Bring a friend and stay awhile – we’ve got your next round. The fine points: Offer includes Beer, Wines by the Glass and Cocktails. Shots not included. Limit one per table, free round given during same visit, same or lesser value. Valid in store only. Offer Cannot be combined with any other in-store promotion. All parties must present valid ID. There's still time to order Catering or delicious authentically Italian Marco's Coal-Fired Take & Bake for your Easter party! Call 303.296.7000 Or Click to see our complete catering menu! 24-hour notice appreciated, Order by NOON on Saturday 4/20 for Easter pick up! We're excited to bring you this month's feature menu - full of classic, fresh, sweet & savory flavors! Back because it's just SO flavorful and filling - The Farmer Pizza - loaded with Garlicky Roasted Kale, Sweet Italian Sausage, Mixed Mushrooms, Ricotta and Mozzarella. Topping off the menu is our Eggplant Parmie Sandwich- so full of Sauce and melted cheese any East Coaster would be proud, and Spinach & Artichoke Dip because we just can't stop eating it!!! 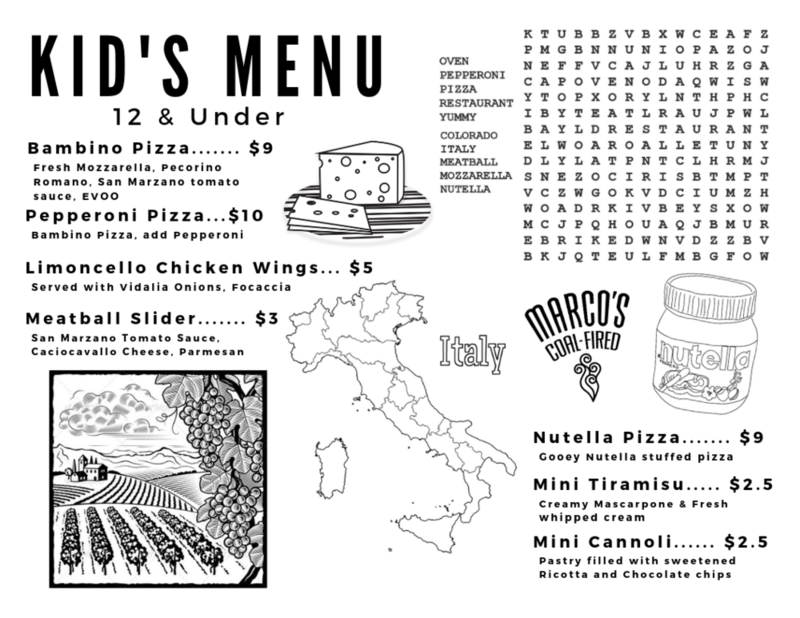 Many of you may know we have a small but mighty Kid’s menu here at Marco’s Coal Fired – and this week only, we are welcoming you to come on over with the family for a Free Item off the Kid’s Menu with Adult Entree Purchase! We are ready and rearing to go for Spring with favorites to entice us while we gear up for the official start of patio season in April! Creamy Tomato Basil Soup, and our NEW Eggplant Parmesan Sandwich are PERFECT for lunches, whether power or otherwise. Craving something for sharing? Perennial favorite Artichoke and Spinach Dip and a meaty stuffed Sausage and Peppers Calzone are just the ticket. Thought you missed your chance for a Salted Caramel Pannacotta? Well, this little dessert was so popular when we tried to end it after one month, we heard personally from staff at both stores that we just CAN’T end it yet! Don’t miss out this month!